Pro Kabaddi 2018 Final, PKL 6 Bengaluru Bulls vs Gujarat Fortunegiants Highlights: Bengaluru Bulls won maiden title. 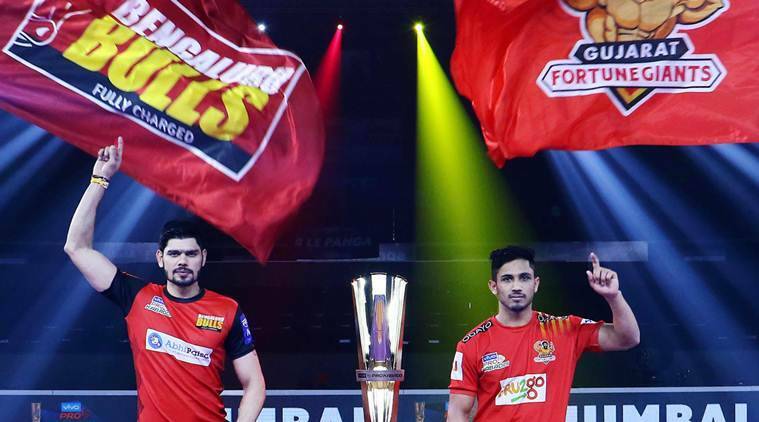 Pro Kabaddi Final, Bengaluru Bulls vs Gujarat Fortunegiants Final Highlights: Bengaluru Bulls beat Gujarat Fortunegiants in the Pro Kabaddi Season 6 final at the DOME@NSCI SVP Stadium in Mumbai on Saturday to lift their maiden trophy. Both the sides had been previous runner-ups but Bengaluru made a brilliant comeback in the second half of the final match to win the battle as well as the title. This is Bengaluru’s second consecutive win against the same team. Gujarat first went down to Bengaluru in the Qualifier 1 and had to fight their way to the final before the new champions ruled the mat to take home the title of Season 6. Bengaluru Bulls beat Gujarat Fortunegiants 38-33 in the final to lift the season six trophy. This is their maiden Pro Kabaddi trophy. They make a brilliant comeback in the second half to inflict two all outs on Gujarat and take the title. That's another ALL OUT inflicted on Gujarat Fortunegiants, who are in trouble now. Bengaluru take crucial points towards the end of the match as the score reads 36-30. Rohit gets Gujarat Fortunegiants back in the game with a fabulous raid. What a match! What a final! Parvesh locks both the ankles of Rohit as Gujarat stretch their lead to four points. Gujarat leading 18-12. The second half of the Pro Kabaddi FINAL is underway in Mumbai. Will Bengaluru make a comeback? Despite a confident start, Bengaluru Bulls falter and go into the half time trailing Gujarat Fortunegiants 9-16. Bengaluru Bulls walking out of the mat as they succumb to their first all-out by Gujarat Fortunegiants in the final. With that, Gujarat take a six-point lead. What a thrilling start to the final of the sixth season. From 3-3, the finalists take it to 6-6 at the end of the first ten minutes. Pawan Sehrawat blows across the Giants' court with such confidence, bringing a point and a revival for the Bulls, but Prapanjan takes it right back in his do-or-die raid with a hand touch. A positive start for Bengaluru Bulls as they take the first point of the final match. Bengaluru Bulls have won the toss and have chosen court. Hello and welcome to our live coverage of the Pro Kabaddi 2018-19 final between Bengaluru Bulls and Gujarat Fortunegiants. The two sides fight for their first title. Both sides have been previous finalists but one of them will go home today with the title. Follow live score and updates here. Pro Kabaddi 2018 Final Live Score, Bengaluru Bulls vs Gujarat Fortunegiants Final Live Score Streaming Online: Zone toppers Bengaluru Bulls and Gujarat Fortunegiants will take each other on for one final time in Season 6 in what could prove to be a battle between the season’s best raiding unit and the best Cover duo of the campaign. 1 Pro Kabaddi League Final Live Streaming, PKL Season 6 Final: When and where to watch PKL final?